Features a unique design made up of crossover straps interlaced together. The style offers a narrower fit at the toe due to the makeup of the design. The adaptable strap can be wrapped underneath the arch as shown or around the ankle. It is ultra flexible and lightweight. The gel padding offers cushioned support. NOTE: English to American Sizing is approximate. The information is shown as a guide only and not a guarantee. Actual fitting may vary. 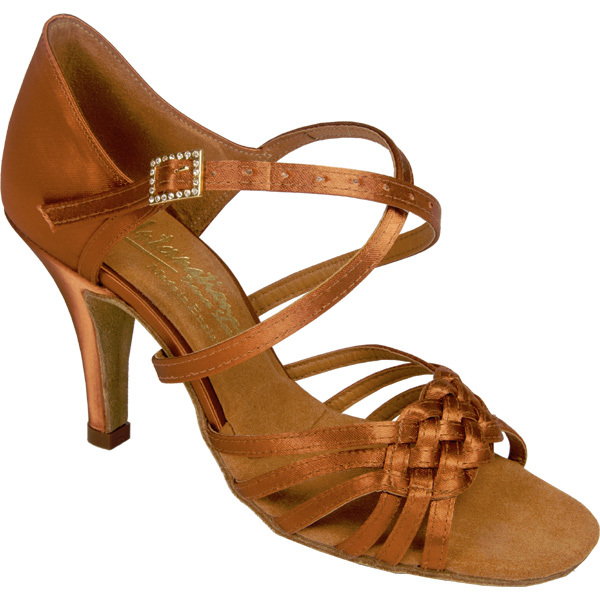 Available in American 4.5 thru 10.5 Medium Width, Dark Tan Satin with a 2.5 or 3″ Elite Heel.